At Framagraphic Custom Picture Framing we often have customers inquiring about a custom picture frame for a collection of military medals. This is the story of one such project we did recently for my mother. She had been holding on to a box of medals that once belonged to her grandfather –Grandpa O’Donnell, or Frank O’Donnell. Frank O’Donnell would be my great grandfather. In the late 1920’s and early 1930’s Frank O’Donnell worked as a meteorologist. Not just any meteorologist, though, he was the chief weather forecaster for Canada. At the time the British were working on a pair huge dirigibles or blimps –like the Hindenburg- that would travel the globe and unite the empire with a network of far-reaching flight paths. The pair was known as the R-100 and the R-101. On its maiden voyage across the Atlantic Ocean in July, 1930 the R-100 travelled from England to St. Hubert, Quebec outside of Montreal in about 78 hours. Frank O’Donnell was responsible for providing the ship with up-to-date weather forecasts as they got closer and closer to Canada. The R-100 spent a few days around Montreal and then made a quick trip to Ottawa, Toronto and Niagara Falls before heading back to England. But being a stubborn old Irishman, Frank O’Donnell wanted nothing to do with any British medals. 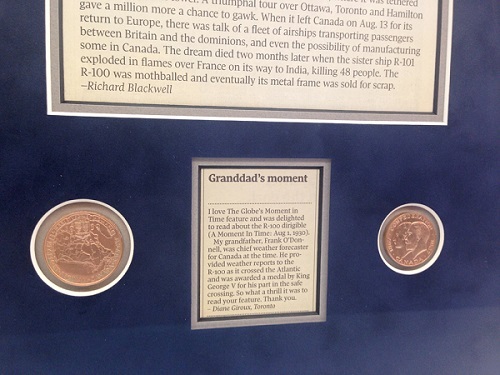 He never did go to Ottawa to receive them -but his daughter later did. Because of his feelings towards Britain, the medals stayed in a box in a dresser drawer for decades. Eventually they ended up in my mother’s hands. I remembered her showing them to me once, so I called her and asked if I could frame them up as an example of the kind of custom shadow box medal framing we do here at Framagraphic. At first she said yes and sent them to me. But before we could get started, she called back and asked me not to. She felt that if Grandpa O’Donnell were ever formally recognized as the recipient of these British medals, he’d turn over in his grave. So the medals sat in my dresser drawer for a while until she finally said, yes, let’s just do it. The collection of civilian medals awarded to Frank O’Donnell for his contribution to the R-100’s crossing of the Atlantic Ocean in the summer of 1930. 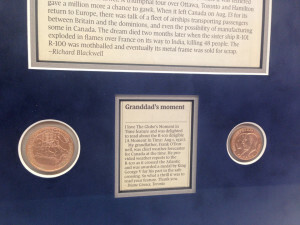 The items consist of three medals and two coins issued by the British government in the 1930s along with two clippings from The Globe and Mail newspaper. One is a short piece The Globe ran on the anniversary of the R-100’s crossing with a photo of it moored in St. Hubert. The other is a letter to the editor my mother wrote to The Globe mentioning her grandfather’s contribution to that effort. I handed the items over to Keith who took it from there. Given that these are civilian medals the rules for displaying them are not a rigid as those for military medals. After polishing the medals and cleaning the ribbons everything was mounted securely in the frame. 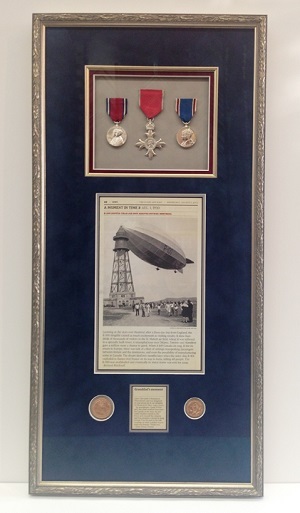 A close up of the silver Allegra frame by Larson-Juhl and filet surrounding the medals. 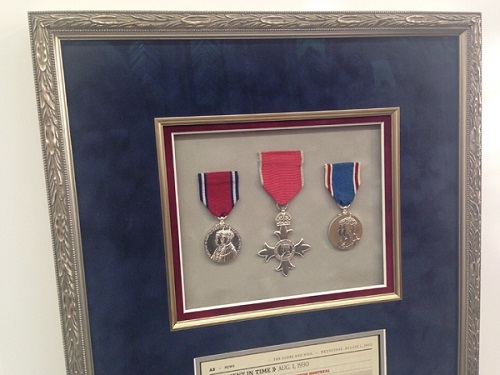 For the frame Keith chose a simple Larson-Juhl moulding that is similar in silver colour to the medals. The main mat colour for the job is a rich blue velvet mat. Around the medals is a silver filet and a thin red undermat. The medals are laid out on a grey velvet background in their window. Around the newspaper piece the undermat is a silver mat with a black core. To top it all off we used museum glass to give the piece amazing clarity, minimal reflection and maximum protection from UV light and the fading it can cause. 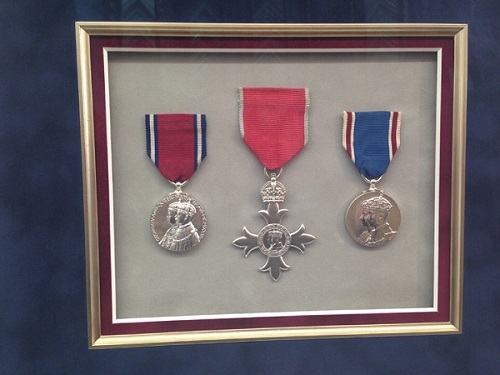 The medal in the middle is the Member of the British Empire Award. 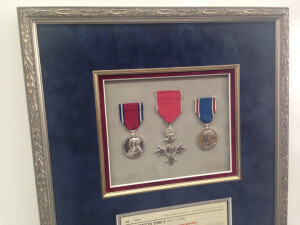 The medal to the left with the red ribbon is the Silver Jubilee Medal for the 25th year on the throne for King George V. The medal on the right with the blue ribbon is to commemorate coronation of King George VI. One of the two coins included in this collection was awarded to commemorate the 60th anniversary of Canada’s Confederation: 1867 – 1927. The other coin we’re not so sure about. Once the shadow box was all carefully mounted and secured the frame was packed up for shipping. I took it to FedEx in time for a Christmas delivery to Toronto. My wife and I were not able to attend the Christmas festivities in Toronto this year so we joined everyone via an online video link. Everyone was at my brother’s house on Boxing Day with my wife and I attending via someone’s laptop on a coffee table. When it came time for my mother to open her gift, the laptop we were watching from was turned towards my mother. As I sat in my living room with my wife and our morning coffees I watched as my mother opened the present. It was strange seeing something that was built right here in our Broadway shop a couple of weeks ago now being unwrapped 5,000 kilometres away –on a video screen –by my mother. She had forgotten all about the medals and was completely surprised when she opened it. For a moment she was even speechless. And then the tears started to flow. Pretty soon there was not a dry eye in the house as she told the story of her grandfather to the younger generation of kids. Talk about a Christmas to remember. Memories often make the best presents.